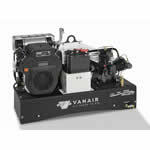 Air compressor generator combos help you save space, time and money by combining heavy duty air compressors with welders, generators and jump start units. 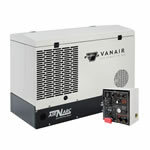 The Vanair Air-N-Arc lineup are combination air compressors with a built in generator as well as adding welding capability and some models with jump start capabilities. 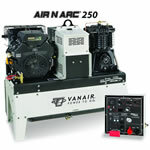 Models range from the Air-N-Arc 150 with 5KW Generator with a 20cfm air compressor and 150 Amp DC Welder all the way up to the Air-N-Arc 300D that boasts a 7KW Generator, a 40 CFM Rotary Screw Air Compressor, a 300 Amp DC Welder and 12 and 24 Volt Battery Booster Jump Starter, all powered by a 25 horsepower Liquid cooled Kubota Diesel Engine.